If you’ve lived in your home for any amount of time, you probably have cupboards and drawers full of things that you keep ‘just in case’ or for ‘sentimental reasons. Of course, it's fine to keep things around you that remind you of special places and people, but when the clutter starts to become a mess, and takes over your house , and you can’t find anything, maybe it’s time to declutter and get rid of some of the things you never thought you would. Everything In Your House Is Not Essential! You may think that you need everything in the house and that as soon as you are brave enough to throw it out, you’ll need it, but that’s rarely the case. Have you used that gadget in the last six months? Well, you probably won’t in the next six either. 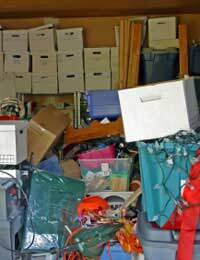 Be absolutely ruthless when you approach the decluttering process, junk is junk, and if you haven’t used or worn something in as long as you can remember, it’s pretty redundant really. Attack your wardrobes with vigour and you may be able to make extra money selling unwanted clothes at car boot sales or on eBay. Let’s face it, you probably won’t get back into that party dress from five years ago now, no matter how often you get it out, gaze at it lovingly and remember your old figure. Bin it, donate it or sell it. It’s no use to you in a drawer under the bed. Humans seem to be hoarders by nature – we all keep things just in case we need them, and stash them away for another day. Some people are also collectors, and that’s a harder habit to declutter but at least collections can be housed in one place, out of the way! Don’t put it off until another day. It may look like a massive task, but once you’ve done it, you will feel great. Get the rubbish sacks out, get your rubber gloves on, and just dive in. You don’t have to do this all in one go. Set a time that you are willing to spend on it and do it every day, half an hour is a good start. Unless you are the type of person who thrives on a challenge, in which case, just blitz it and have done with it.Start off with a small space...try the spare bedroom and start there, or a cupboard under the stairs. Once you’ve cleared that space, you’ll feel a sense of accomplishment and want to carry on. Be realistic when it comes to what you keep and what you throw out or give away. Do you honestly need to keep all the kids old toys? Why not hand them onto a friend or relative, or put them on eBay or another auction site. Once you’ve done the big Declutter, try and keep it that way. Don’t see your handiwork as the perfect opportunity to start filling the drawers up again! Invest in some great storage so that you know where important things are, and be ruthless about not hoarding things once you’ve got rid of the last load.